Data Deep Dive: 3 Weeks Left, Who Can Win the Fall Season? With just 3 weeks left in the Fall 2015 Fantasy Movie League season it’s time to take a closer look at the standings and examine who has a chance to win the entire 13 week stretch. At stake is a 1 year Movie Pass subscription along with the respect and admiration of all other players. But who still has a chance at the big prize? As the quotable Herm Edwards once said, “You play to win the game.” What I’m trying to determine is, who still can? The kind developers at Fantasy Movie League gave me the weekly cumulative scores for the top 500 players as of the end of Week 9. I manually added to that for Week 10 to generate the graphs below. 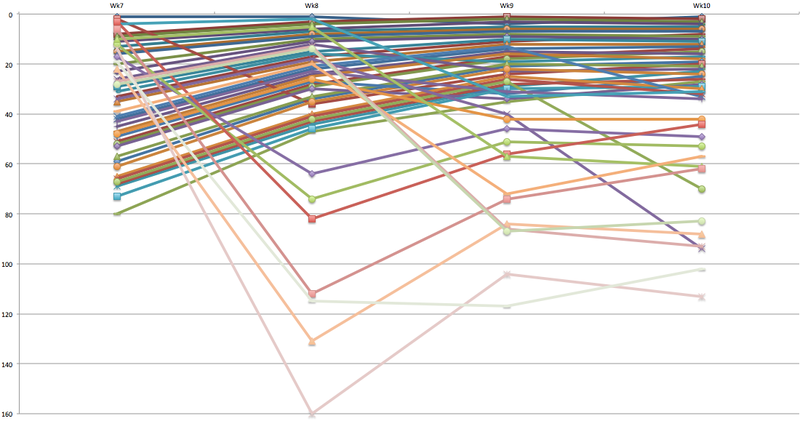 What I sought to figure out here is, who still has a mathematical chance to win the Fall 2015 Season? A “Magic Number” of FML, if you will. So, what is a reasonable amount of ground to make up each week on people ahead of you in the standings given that the top 500 represent the best FML players around? As a thumbnail I looked at the top scores each week and compared them to the 5th best score each week for weeks 1 through 8 of the FML Fall season. The argument there is that a top player may not choose the Perfect Combination each week but he or she will likely pick something close, so I arbitrarily chose the 5th best lineup each week. If you average that over the first 8 weeks, you get a difference of $13.4M between the top pick and the 5th best one. With three weeks left, if you did $13.4M better than everyone ahead of you all three weeks, who still has a chance to make the top spot? You’d have to hit on the Perfect Combination bonus each week but several players have had three of them this season, you’d just have to do it in consecutive weeks. Given all that, who is furthest back in the standings that still has a theoretical chance given this Magic Number of $40.2M of catching up to do these last three weeks (Monday scoring issues aside)? The answer is Broken Scott Hall Film Projector who currently sits in 30th place, $36.9M behind first place Faking it in Florida. Here, we can see that Bbondsmvp’s Cineplex was in 80th just a month ago but two Perfect Combinations have led to an inclusion in the top 30 and demonstrates just how much ground can be gained in a short amount of time if things break a certain way. Good luck to everyone in the top 30 and I’ll take another look at this same set of data next week. Now you can see the movement both into the top 30 and out of it. The thing that jumps out at me here is that the lowest anybody has jumped into the top 30 is from 80th but someone fell as far out of it as 160th before climbing up again. Note that everyone on this graph is still better off than I am in 238th place so I judge no one 8). I think you’re being a bit generous with the top 5 lineup estimation, even for the top players. I can’t check back the same way on other players (without a lot of clicking), but personally I have played a lineup that finished outside of the top 1500 four times so far this season. Our current leader has five weeks already this season where he/she has been at least $15 million away from the perfect cinema. It comes down to the Best Performer each week – if you have it your lineup, even if you don’t hit the best combination, you’ll still be fine. But on the weeks you don’t, especially if its one that can be played on 4+ screens, you did a hole very quickly. I’ve got a new figure for you to use to see who is still in the race. It’s also somewhat of an arbitrary figure, but less so than your choice of a top 5 lineup every week, and it comes up with a similar result. Besides, I can’t really think of a way to predict something like this without using a figure that isn’t at least somewhat arbitrary. Through Week 10, if you had a Perfect Cineplex each week, your total would be $1,014,880,186. Since the current leader, Faking It in Florida Cineplex, has a total of $878,690,136, their average amount off of perfection per week for the 10 weeks is $13,619,005. Multiply that times the three remaining weeks, and you have $40,857,015.00. This would put the top 36 in place for the title, if one of them were to have 3 perfect cineplexes to finish the season. You can revisit this figure next week as well if you want with updated figures through Week 11.